I'm sorry for not getting back to you sooner and not posting for several hours now. ["Geez, slacker", you might say.] But here is the result of the the suggestions I recieved from Kyle, Jerry, and Brandon. As you can see I took the majority advice and stuck with one handle. Sippy cup kept ringing in my ears! 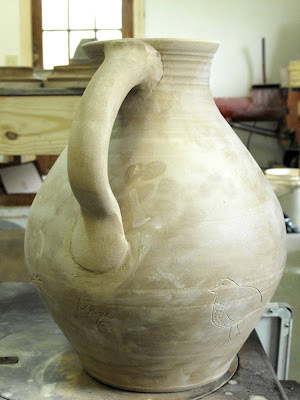 I did take liberties, though, of applying the handle on the left, as you can plainly see. I think it's only fair to give those lefties their due. the row below are clearly for the right brained. 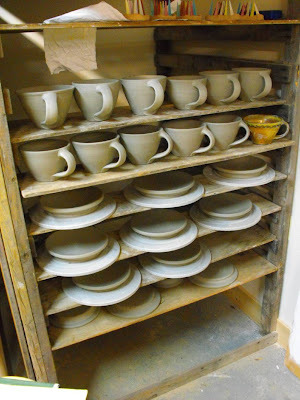 Ok, here is the rack with big breakfast cups that I handled after supper. 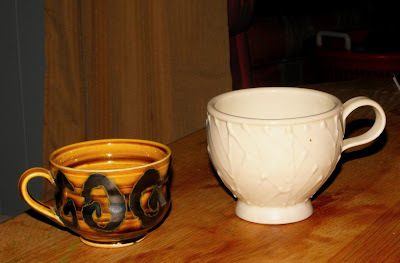 The amber glazed cup at the right is the prototype. 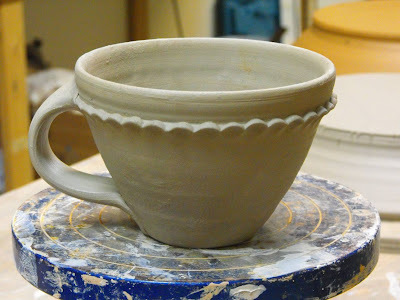 These should hold, when fired, a tall grande latte from your neighborhood barista. There you have it. Tomorrow is another day and another month. Lillian will turn 5 in four days. I will get to some brushwork real soon. 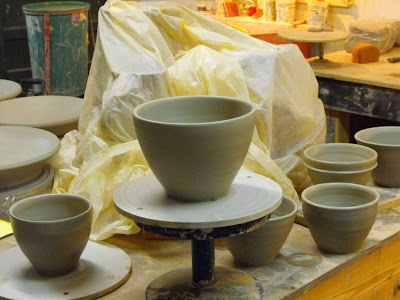 The bisque kiln is still rolling and I will most likely have a few pots that will have to be raw glazed. 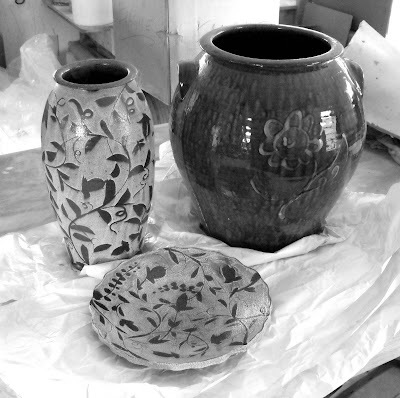 Did I mention that this firing is primarily for my solo show at Leslie Ferrin Gallery in Pittsfield, MA ? 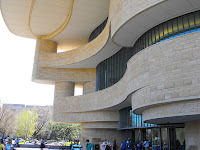 More on my history with the Ferrin Gallery soon and other cool stuff. Nighty night. 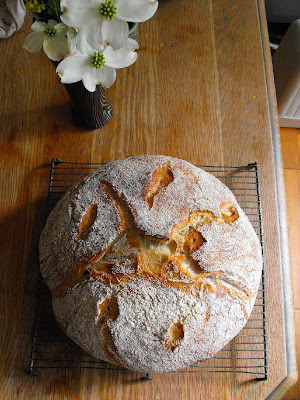 After I tattooed this pot with some dainty scarification, I ran down to the house to save the loaf of bread I was baking, just in the nick of time. I think it may be the best ever. [We'll break it at dinner time.] The last loaf I made could of baked a few more minutes in the oven. It all worked out! maybe because I could hear mine rumbling? maybe just because it's a belly? not Mark Boyd, just a boyd. Here's a picture sent in from the fly on the wall. Today, for maximum output, I'm having not red beans and rice, but rather, red beans and cous cous. I'll spare you the picture on this once. There's more important stuff to take pictures of after all! Other trivial tidbits. I'm loving the "album", Unstoppable, by Girl Talk. Now you have the complete picture. "Look for the union label." As some of you have no doubt noticed the posts have slowed down to just 2 a day (ha) and I haven't been answering my phone this past week. 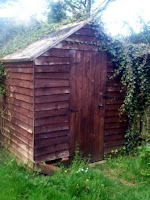 That because I'm deep in the woodshed. [This is a phrase I first heard from a budding saxophonist up in Northampton, MA years ago. 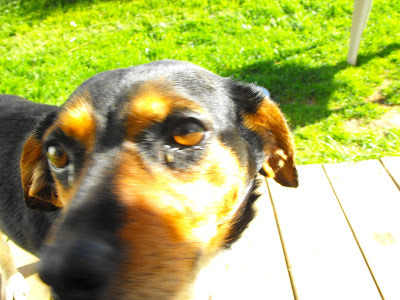 He would say that he was going "to shed" which is jazzy-jive speak for getting really into it. Think of a trance state of mind, deeply focused.] That's where I'm at and I'll only come out to eat and sleep (and blog). Well, that may be an exaggeration. Now it's off to the shed for some real hand's on fun! no time for laying around on the porch. don't be fooled by the angle of the picture. the "cup on the banding wheel is a 4 pounder! 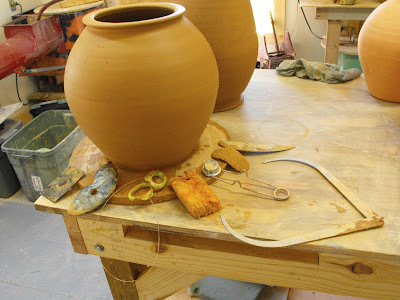 Some pictures of Tuesday pots as seen by the fly on the tripod. mark left by a wet towel on my table. never a dull moment when your eyes are open. From the sublime to the rediculous. It's a froggy and foggy evening of semi frantic potting, here. I'm no angel! But these guys are. "Not many people have songs about dirt, but..."
when it blows in a crimson tide." --Gillian Welch "Red Clay Halo"
A few things to report, today. 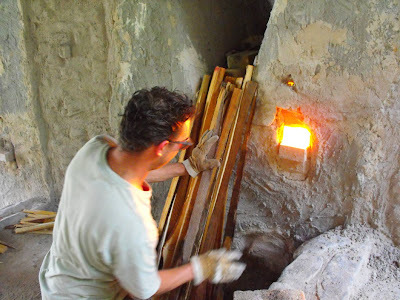 Aside from a couple of new grates needed, and stoke door maintenance, the kiln is ready! 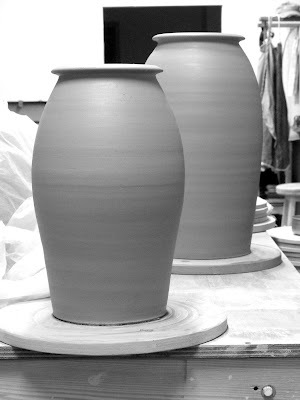 The pots are being bisque fired on a daily rotation. 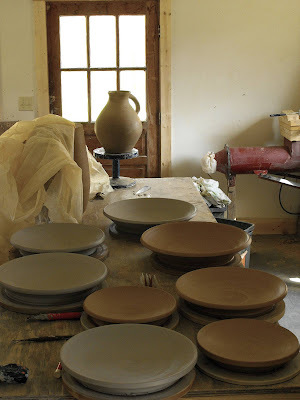 Clay waiting to be made into the pots needed for the show at Leslie's. Also, Micah and I cranked up the old mixer. If you remember from previous posts, I purchased an old mixer from Tyrone Larson over in Asheville, back a few months ago and lugged it back up the mountain from Asheville. (the Larsen's used to live just over a few miles from me until about 10 years ago.) 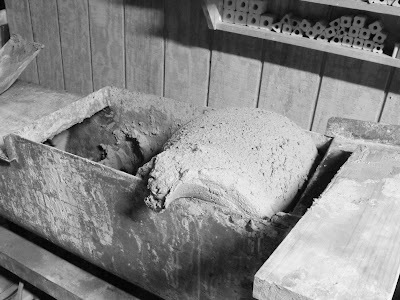 They have, no doubt, mixed tons of clay in this mixer and moved it to Asheville with them. They sold it to me, and I hauled it back "home". It seems to be working just fine. 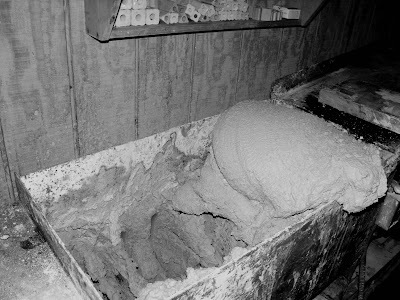 The photo above shows a "wave" of fire clay/sand mix I'm using to clean out the mixer. First we hosed out all of the iron rust flakes and leaves, etc. that were in the mixer. We then dumped in about 100 lbs. of sand and 200lbs of fire clay, added water and watched the mix with our hands in our pockets! I still want to devise some safety switch and screen covering over the hopper. The auger moves pretty slowly but I don't want to take any chances. There is a reverse and forward switch that helps mix the batch. 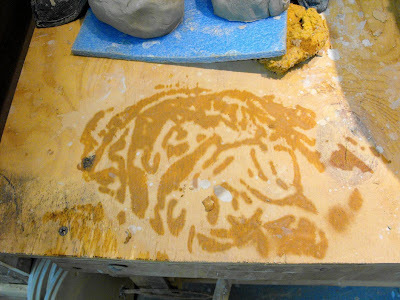 When it was ready I reversed the switch and the clay came out the 3 inch pug at the other end of the mixer. (sorry, no picture) I think I could mix at least 400 lbs at a time, maybe more. 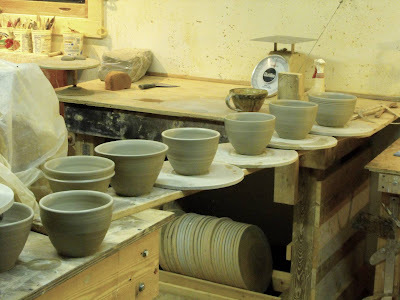 There's nothing like a big ole batch of fresh clay to get a potter spinning! I'm the helper at Evelyn and Lil's school in the morning so I better hit the sack. More on the May Ferrin show to come. Also, painting and glazing! Here are two jars from last night that have a subtle difference in their "line". I like the one in the background more. I like it because it comes right out from its base and it's line doesn't change direction, but continues to the lip. 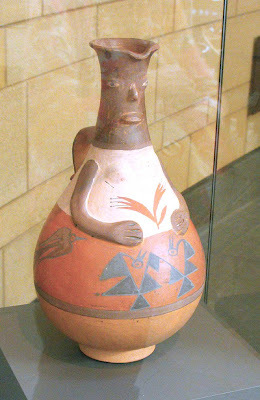 The jar in the foreground has a line that changes direction about a third of the way up it's height. 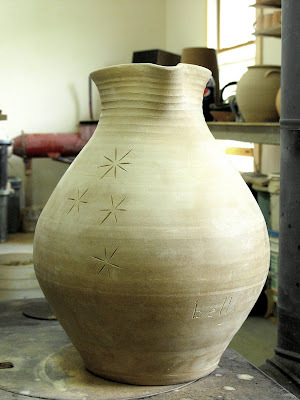 The pots I love from the Catawba Valley tradition have the continuous and unchanging line in their profile. 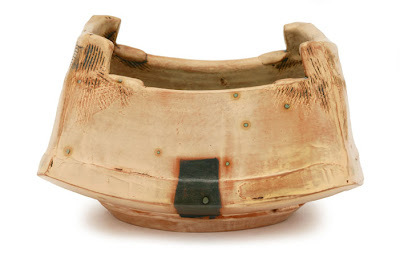 Of course as I type this I realize I risk generalization, but from what I have noticed of these pots in books and in life , it is that distinctive "line" that I find very pleasing. 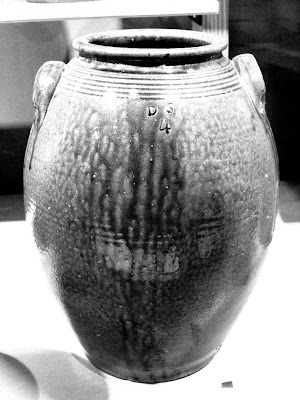 Here is an example of a really nice 4 gallon jar in the NC Pottery Center collection. 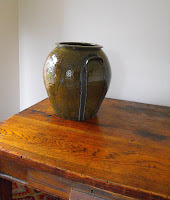 It was made by Daniel Seagle, one of my pottery heroes. It's shape is ovoid, but has that characteristic line that I love. 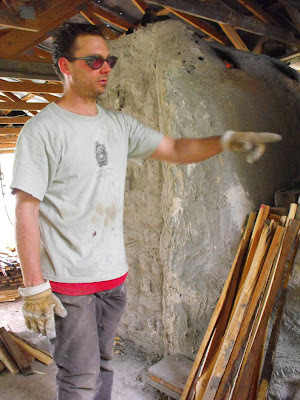 Things heated up yesterday and it was a sawdust kind of day, cutting and stacking wood for the upcoming firing. 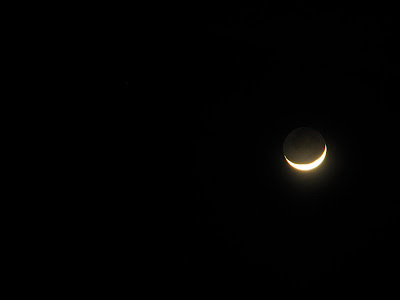 But it cooled off nicely in the evening. 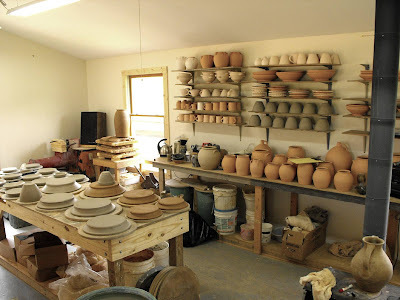 Looks like we may be firing the kiln around the full moon. 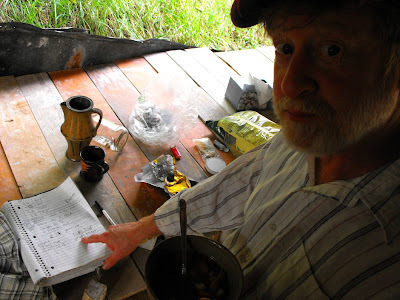 I'll have to consult my charts. I thought Dan's tool exposé was so good, I thought I would show off some of my axes. Here's what it took for me to make the jar, although not as tricked out and modified. Found these cups in a shop in Spruce Pine. not the ideal bracket, but they're paid for! I finally broke down today and pierced the holy drywall on the south wall. A wall that I had first designed to have a big six foot wide window, but soon realized I needed the wall for shelving! But I couldn't decide on the shelves, brackets, and procrastinated the inevitable. Instead, I move stuff around constantly during the day, looking for space, when all I needed to do was put the effing cheap metal brackets up and get on with it (already) !!! 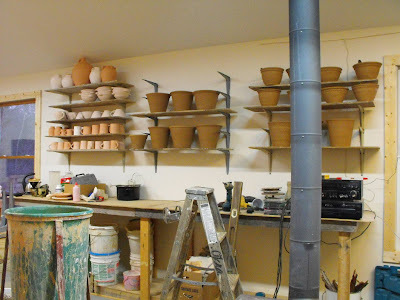 Anyway, the shelves helped to clear up precious table real estate for the pots coming off the wheel and I had my first real day of potting, aside from the time I took to put up the brackets. Incidentally, for those of you who like statistics, the brackets are now on their third tour of duty. 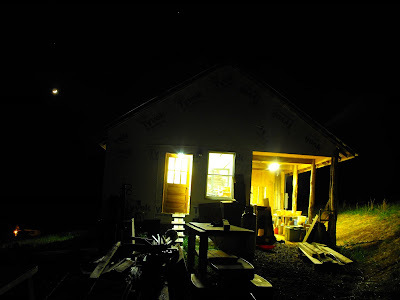 First the Penland Barns studio (1998), then the Micaville studio (2001), now the Snow Creek studio (2009). I made some 4 lb. bowls this evening and wanted to make a real simple serving bowl with a serviceable rim like the ones I used to make on the "bread" bowls, but not as pronounced. So I eventually came up with the ones on these. One thing I like about using bat pins is that I can put a pot back on the wheel and re-do a line or a rim, as I did on a few of the early ones here. Here is a 3 lb. 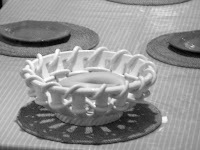 flower pot with a frilly collar that I do with my "special" finger. 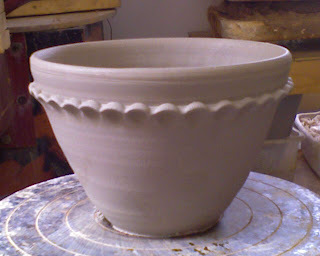 I leave a bead of clay where I want the decorative feature to be and after it has sat a little while and firmed up just a little bit, I go in and push up on the bead to make this collar. 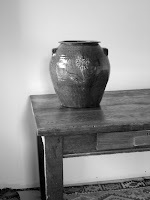 I made a table full of these little planters, this morning and detailed them before supper. With more nice weather, today, I hope to get some more grooming done on the grounds in anticipation for the big shindig coming up next month. The grass seed I 'broadcast' last week is beginning to show itself through the straw, thanks to the steady exchange of rain and sun, P.T.L.! I made several attempts last year to grow grass on the raw clay banks behind the studio, but gave up as each attempt failed. Fingers are crossed that this round one takes. Now if I can just keep the kids from running all over the new grass...and the merrymakers . 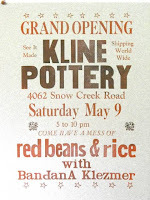 Speaking of merry makers, my father in law, George Lane, is throwing a party to celebrate the new studio on May 9th. (the aforementioned shindig) We'll send more invites out, and if you live around the greater Penland area you might see this poster! As we get closer to the date I'll remind you all. But if your coming from over seas you might want to go ahead and make arrangements for travel. 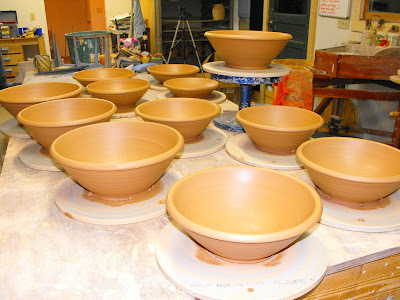 flower pots made with 6 lbs. 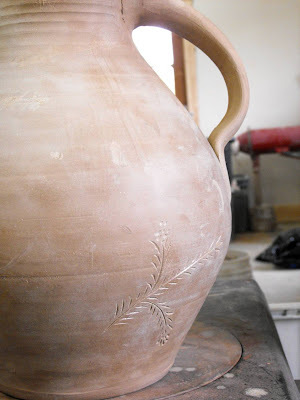 of clay. 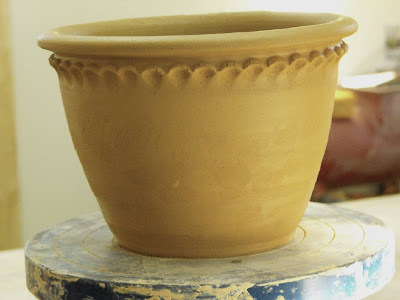 Ha, I was just thinking of the irony of making these pots will ultimately hold more dirt. Thanks for looking, seeing, reading, and indulging me. Someone else is home too! We came home to a porch full of big boxes. 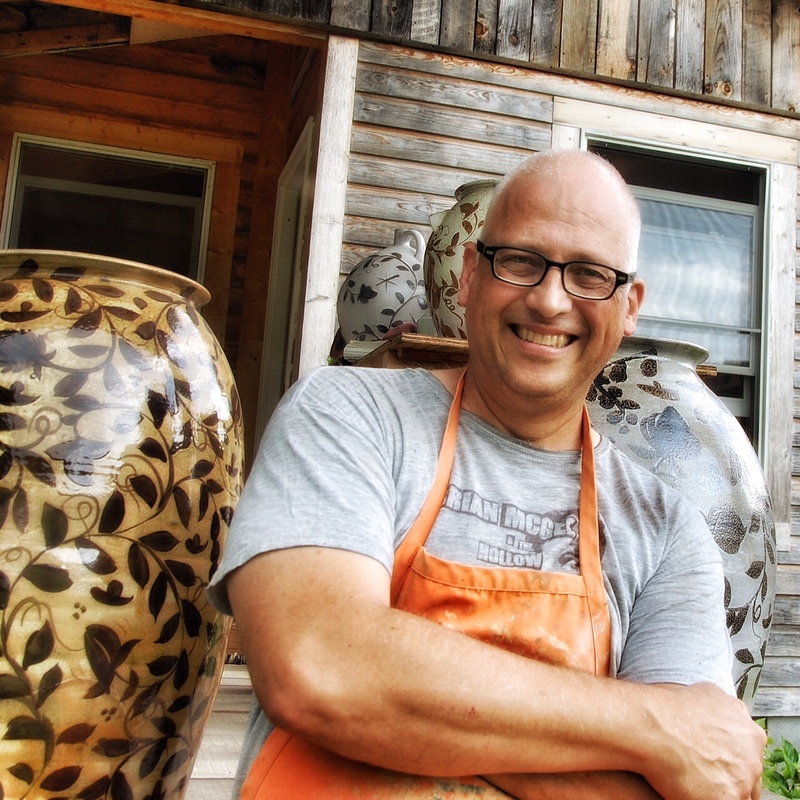 The show at Kohler is over and they promptly shipped the unsold pots back to me. Thank You! 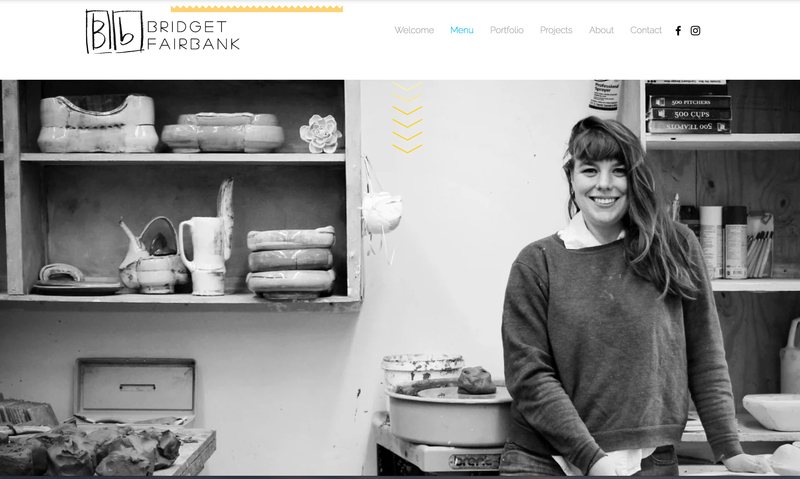 It has been a real pleasure working with Amy Chaloupka at Kohler's ArtSpace Gallery. 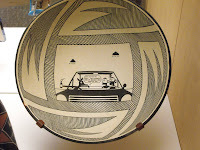 Way too often I have to wait for pots that linger in some back room, because a gallery is reluctant to take the time to pack and ship unsold work back. 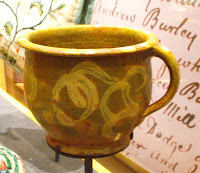 Here is one of the pots that fly back home over the weekend. I still don't know the best way to see this pot. What do you prefer, B/W or color? I stand when I'm throwing on my Shimpo. I've always described it as a more active posture. 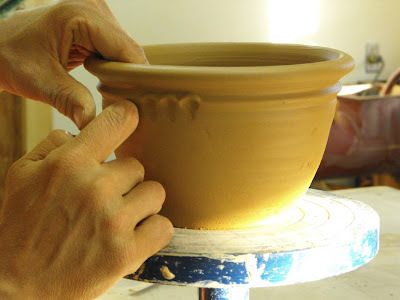 I'm able to step back and eye the pot I'm throwing from a better perspective. Plus, I just like being able to move around, instead of being hunched over in a sitting position. "I've always recognized the value of standing. Standing gives a painter more kinetic opportunity. Body movement and physical action become part of the creative act." So, today wasn't as productive as I would have hoped. Is it ever? I did take a big bite out of the showroom clutter. I made a trip to the dump and stored some non-essential crap things into the deep storage unit of my shop attic. 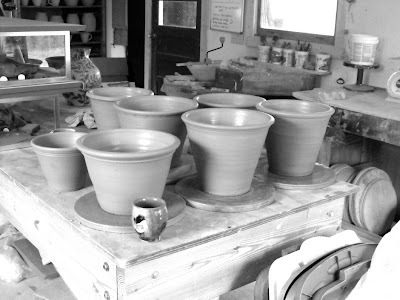 I pugged all of the clay (about 300#) that had frozen over the winter and needed some regrouping. Yay. 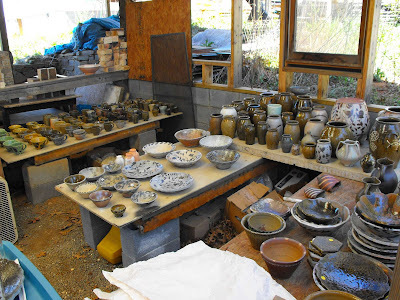 Here are a few more pictures of pots I encountered on the trip over the weekend. I took hundreds of pictures on the trip, mostly of the family. I averaged about 200/day! I'm still editing. More tomorrow. 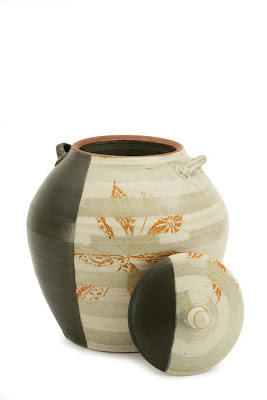 Here's a link to some beautiful "ceramics" from Malin Grumstedt. 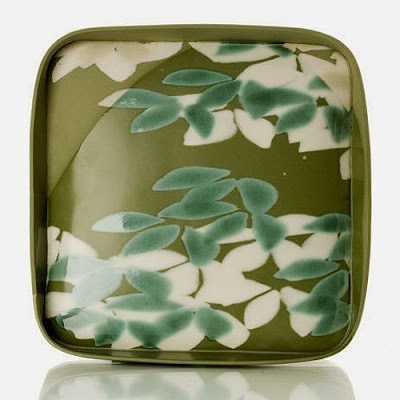 Thanks to Karin Erikkson, of Karin's Style Blog, for posting the link! Sorry I don't have any more info about it origins, etc. We're back from our mini vacation in Washington, D.C. and it's always great to be home. 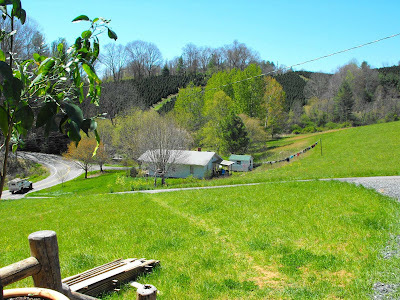 The grass has grown with all the rain and sunshine the past few days, and the green from Spring is spectacular. 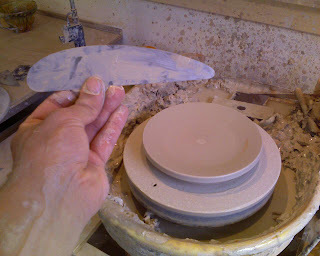 I'm getting realigned for pottery making, today, and firing later this month. 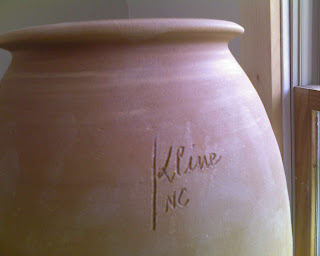 I'm also dreaming up a pottery give-away for this week, so stay in touch. 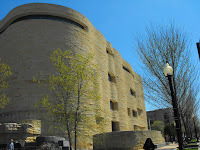 Oh, and here's the link to the Smithsonian's National Museum of the American Indian that I mentioned in the caption above.